by Fred Dukes of the Great Southern Railways (Ireland). It is just one month since our return how from that tour of observation, which my four colleagues and I were privileged to share with the President, Past President, and seventy-two other members of the Locomotive and Carriage Institution. After four weeks out of contact with the actualities of those nine days, I am endeavouring to recall from memory a word picture of the panorama of the things beautiful and interesting which came within our ken. The party of seventy-nine left Victoria Station at 10.20 a.m. en route for the Continent via Dover and Ostend. A pleasant and uneventful journey brought us to the Belgian coast and once ashore we boarded the two coaches reserved for us on the Köln train. Our journey lay through Bruges, Ghent, and Brussels. Here our train was reversed and being drawn from what was the rear end on the journey from Ostend, we left Brussels Station and were soon passing through the Ardennes Country on the Liege and Herbesthal and so on across the German Frontier to Aachen. Here we came blunt up against the German Frontier System of Customs Control etc. Here you cannot hide the inner secrets of your financial position as a traveller. Thanks to the tact and courtesy of the officials concerned this seemingly disagreeable business was got over very smoothly and, having secured the necessary document verifying our financial condition on entering the country, we were allowed to resume our journey to Köln arriving at 11.0 p.m. Here we had to change trains, so moving to another platform we boarded the train for Hamburg, leaving at 11.45 p.m. We had to sleep as best we could for the next few hours. 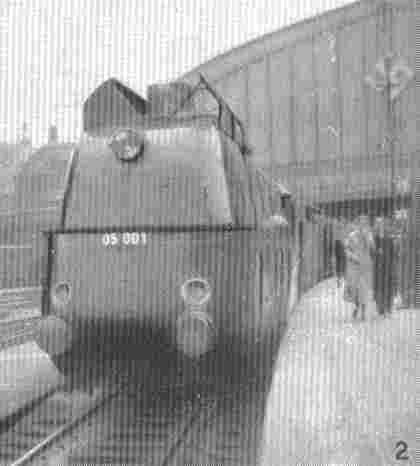 Sleeping berths on this train were few in number and the cost almost prohibitive. Saturday, Lunch on Ostend Boat - Dinner on Brussels Köln train. During the small hours of this morning we passed through Düsseldorf and on to Bremen. Here daylight had come and so on to Hamburg we were able to take up our bearings once more. Arriving at Hamburg at 6.20 a.m. our Secretary, having satisfied the Railway Officials that the credentials of himself and the remaining seventy-eight were correct, we proceeded to the Station Restaurant for coffee etc. 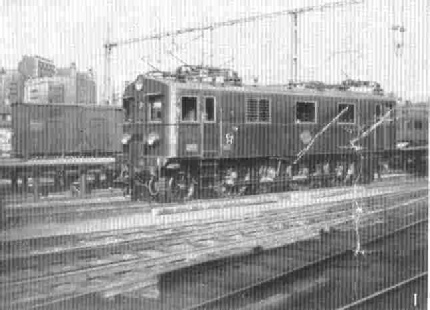 Streamlined Rail Car at Hamburg. This is one of those operating in the Hamburg-Altona-Berlin services. With an hour to spare after the inner person had been satisfied we set off to see something of the City. It being Sunday few people were about, except the youth. The girls were helping charity by selling artificial flowers, and thousands of young Brown Shirts (Boy Scouts) were parading for a day in the open accompanied by Field Kitchens. All boys, no elders. Boys in command and confident in command. Our party reassembled at Platform No. 11 at 8.40 a.m. to entrain for Sessnitz.. Just before leaving Hamburg there drew up alongside Platform 10 opposite to our train, a new stream line Loco. bearing the date 13/5/36. Resuming our journey in a very up-to-date second class coach we were soon heading for the Baltic Coast through Rostock and on to Stralsund. This journey took us through the prairie country now devoted to cereal growing. We were travelling through a vast plain and could see for miles. No ground seemed to be wasted, there were few hedges and boundary marks. Occasionally the railway line and the public road running parallel would pass through a clearance in a forest. Of Highlands there were none, and in such an area of forest and cultivation the homesteads seemed few and far between, but what we did see appeared very desirable places to live in. We could not but remark how very smooth riding our train was. We realised that the coach was the last word in comfort and we almost got the impression that there were no joints in the track, but there were. After lunch on the train we soon made our acquaintance with the Train Ferries. Arriving at Stralsund, the last station on the mainland, after running through sand hills for a few miles, we found our train was being divided into three sections for conveyance over the Strait to the Island of Rügen. Each section was pushed on to an open deck (run through) ferry boat which carried its load over to the corresponding dock on the Island. 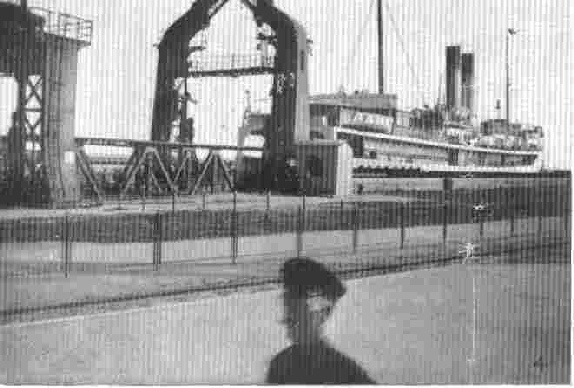 Here the sections were pulled off the ferries, recoupled and the train resumed its journey to Saßnitz on the Baltic . 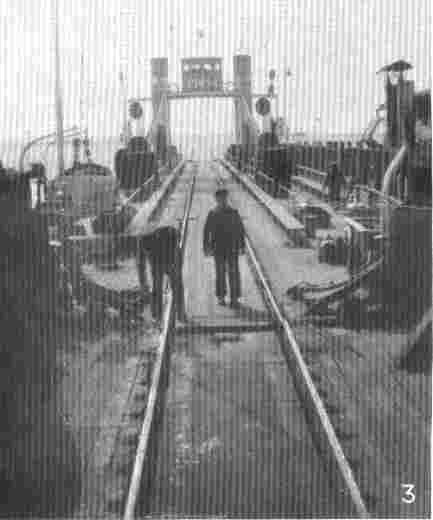 I may say here that at Stralsund there is being completed a steel bridge about two miles in length which will convey the traffic to and from Rugen and thus cut out the present ferry system. Arriving at Saßnitz we left our train and after a few persuasive remarks by our "man of business" to the Customs and Railway Officials we walked aboard the "Frederik Drettning"; a double track tunnel type train ferry built by Swan & Hunter, Newcastle-on-Tyne. Having reached the upper works we found we were on a very spacious and well appointed boat and so were quite at our ease for four hours on that gloriously fine Sunday evening crossing the Baltic, which was on its best behaviour. I think there was only one of our party unable to face up to the, to us, strange menu served on board for dinner. But how good it was and how it put everyone in the best of form for the remainder of the day. As the sun was dropping to the North West we began to see more clearly the land of our hosts to be, and soon we found our boat turning and with engines reversed was approaching the dock. Without any fuss or commotion the pin of the shore ramp dropped into the receiver on the ship and the winches making steady the bow, to prevent the tide drift, we were soon ashore in Sweden. Allocation of the sleeping berths on the train was the next procedure, and as all were anxious to be relieved of the attire we had perforce to wear all the way from London, early to bed was the password. And so, at Trelleborg, ended what we knew of Sunday. After restful sleep we found our train passing through new scenes. We were approaching Stockholm. Between 5.0 and 6.0 a.m. there were many signs of life on farmlands and forest clearings for work had already begun. At 6.25 a.m. our train pulled up in the Capital City and as orders were "not to leave the train until 7.0 a.m." the "still drowsy" had ample time to make themselves presentable. The Carlton was eventually located and here half of the party were quartered, the remainder being billeted at the Ritz. (The Ritz party were a lucky lot shower baths, and eggs for breakfast). Coffee for all at the Carlton on this morning and after we had recovered that facial smoothness now overdue we assembled at 9.45 a.m. outside the Railway Terminus for Press and unofficial photographs. Boarding a special train, in fifteen minutes we arrived at the Locomotive and Carriage Depot called Hagalund. This is a running repair and stock Depot. The activities here include "Oil Gas Production" for use on the remaining gas lit carriages. "Laundering" of all Dining Car and Sleeping Car linen, washing of blankets and floor rugs also dry cleaning of same. Washing of all glassware used in the carriages and the cleaning of dining car utensils and table ware. (Very thorough in all activities). We were privileged to view the interior of the Royal Train which is a masterpiece of travel luxury. The welfare arrangements for the working staff are of a high order. This is only in accordance with the habits of the people. The rows which are in the centre of the Works are provided with hot and cold wash basins, clothes lockers, varying temperature shower and needle baths, vapour baths, and a dining room that would invite an appetite. In this room are gas cookers for the use of the staff. The Engine Shop and Shed are nearby and is evidently a light repair shop. We learned here that each mechanic in the shop is a potential driver and that all drivers graduate from driver's mates or firemen who have reached that position by promotion from the shop. At 11.30 we were met here by our hosts to be for the day, and boarding the waiting Motor Buses we were driven through country of the type that would make one hark back to the Hans Anderson kind of story of wolves and bears, gnomes and elves and the woodlands. Yet all seemed so quiet that lovely spring morning. After several miles run on the fringe of the City of Stockholm, we arrived at the works of the Gas Accumulator Company at Lidingö Island. In the grounds in front of the works, after the various introductions had been made, the Managing Director made an outline of what we were to see known to us. Divided into three groups, each led by a demonstrator, our party first visited a room which held various examples of apparatus for use in lighting and sound purposes on Lighthouses, Beacons; and Buoys. (1) An Acetylene Intermittent Flare controlled by Sun Valve. (2) Automatic Renewal of Incandescent Gas Mantles on unattended Beacons. (3) Atmospheric Control of Valve operating a Bell Buoy. The next department visited was engaged in the production and compressing into Cylinders and Containers of Industrial Gases. In another shop we saw those gases, particularly Oxy-Acetylene in use in the manufacture of heat radiators of from 3 to 20 sections. These being later subjected to a pressure of 5 Atmospheres under water as a test for air tightness. Leaving the Works we found the Motor Launch "Gas Accumulator lll” with refreshments an board waiting to take us down the Delta and among the islands to Stockholm. As we were passing into the harbour we saw portion of the Dutch Fleet who were also visiting Sweden. Going ashore and ascending by lift to an elevated promenade leading to the restaurant Gondolen, it was here that the A.G.A. had chosen to entertain our party to lunch. There is still room for debate concerning the very appetising mysteries included in the menu that day and also why the order of procedure was changed. Possibly it was due to our nearness to the Arctic Circle, but why, after cheese and coffee, what some would describe as "Cutlet a la Bruin" which after all you had to admit was very choice meat. Lunch over, compliments and bouquets handed round; we had a few minutes in which to get a survey of Stockholm from our elevated viewpoint. From here you could pick out the principal buildings, the various arms of the Delta and the Islands. The traffic streams on the roads and many bridges, and the various devices in road, bridge, and tunnel construction to cope with the modern road usage. Now we were taken for a motor tour of the city and visited the Town Hall, a modern building of brick, built in 1916, exterior massive and severely plain. The interior is a treasure the people can be proud of. Concluding our tour at our Hotel door in time for dinner finished our main activities for the day and we were at leisure for the evening. I have not much to say about Tuesday except in a general way. This was a day to delight the Sparks and Electrician Technicians so I am leaving to my colleagues the data necessary to complete the day's story. Leaving our rooms at 6.30 a.m. and having broken our fast, we went to entrain on the 7.45 for Västerås. Our guide and friend for the journey out was the C.E.E. Railways. Our Loco. was electric and adjoining was an instrument car. Here presided the Chief with two or three assistants ready to satisfy the curiosity and solve the technical problems which any member of the party found difficult. We were invited to share the cab with the driver for a few minutes in relays of four. Two hours running through interesting country on that lovely morning brought us to Västerås where we were welcomed and then marshaled in the direction of the A.S.E.A. Construction Works. At the entrance a group photograph of the Party and Guides was taken, a copy of which we have now received from the A.S.E.A. The party was divided into seven groups and our group, No. V1., was fortunate in having as guide an excellent conversationalist in our own tongue. We found these works very extensive and occupying many floors. In the first Section we visited, all types of electrical machinery and other essentials and accessories were under manufacture, both male and female labour being employed. The organisation of the Shops was of a very high order and the sequence or belt system was very evident everywhere. The upper floors were devoted to the winding of the small armatures, the mounting of commutators, small repetition machine work etc. The lower floors assembling, testing, and heavy machine work. A half mile away was the section of the works devoted to heavy construction. Here the heaviest type of Generators &c. are constructed. Railway trucks were being fabricated to house transformer plant. These units are transferable about the country and easily returned to shops for overhaul. The only foundation necessary in the transformer shed is a railway track. Following a most interesting morning tour we walked into the very picturesque town and were the guests of the A.S.E.A. for lunch. Here we were made quite at home by the charm and informality of our hosts. We were at first somewhat intrigued by customs to which we were introduced. Thanking our new-found friends for the instructive and happy few hours we had spent in charming Västerås, we left for Stockholm at 2.30. An hour in the shops and then dinner over we made our way to "ILIS 1936”, Stockholm's International Aero Exhibition, for the remainder of the evening. This morning, gloriously fine (no rain since leaving Dublin) saying good-bye to our very comfortable hotels and Stockholm, which had welcomed us so heartily, we were today to cross the Peninsula. So assembling in the well arranged and spacious Station Hall, the last adieus were given and we entrained for Hallsberg. As we travelled into the open country, it was a tonic to the mind and lung to ride an the open platform at the end of our coach, taking in the scenes and inhaling the invigorating air. From here one could get a good conception of Sweden's pastoral life. The country was just awakened and bursting into being again after lying under Arctic conditions for two-thirds of the year. The country reminded me of somewhere, possibly some parts of Scotland. At Hallsberg we were shown over the Transformer Station and Sub Power Plant, before going on to Örebro to visit Huvudverkstaden or Loco. & Carriage Repair Shops. The Management were our hosts at lunch on arrival and we were given a hearty welcome. Then five groups were formed headed by the C.M.E. and Officers and a tour of the Shops occupied two hours. We were shown over the various Repair shops and the special preparing shops, Woodworking, Polishing, Spraying and Trimming on the carriage side. In the lifting shop precision instruments were in use for the alignment and balance of carriage frames and bodies on the bogies. In the heavy manual workshops we found that their system was on a parallel with that we saw at Olten in 1935. Draw gear and buffing gear units being reconditioned and restored to standard by press tools of various shape and power. Generally there seemed to be an air of tranquillity prevailing. Constancy, smoothness, no hustle, 99% were on piecework rates. The Welfare Department is in charge of a Doctor who is in attendance four hours daily in a four room dispensary over the dining rooms in the Works. Two male attendants are employed to help in the Dispensary and be at call for any part of the Works for major casualties. We learned, during our walk through the Shops, that the Railways are fast being electrified and, now have 150 Redundant Steam Locos, as a result of the progress made. The usual course to adopt would be to scrap these "Puffing Billies" but the Government will not allow this scrapping to take place. They have ordered that these Steam Engines are to be stored ready for service to meet a national emergency brought about by natural or other causes. Leaving the Works at 4.30 we were conveyed to our train by Bus. Thus saying Good-bye to Örebro. We were now on our way to Göteborg. Dinner on the train whiled away part of the four and a half hours of the journey and we arrived at the western port at 9.0 p.m. Grand and Eiggers Hotels provided our billets so here we were in new surroundings and the weather showing signs of breaking. This being Ascension Day, we awoke to find a Sabbath like air pervading in Göteborg for, like in most Continental Countries, Sweden was observing the Church Festival as a general holiday. Our venue for this day was Trollhättan and, as we had anticipated by reading the general itinerary, it was to prove one of the most interesting and enjoyable days of the tour, and as our train was not due to leave before 9.20 a.m. we could take our coffee more leisurely on this morning. At the scheduled time all were aboard in restful saloon coaches and were taken to Trollhättann, along the side of the Göta Cannal. Here we were taken in tow by the 'Nohab", a small tank Loco over the Nohab Railway to the Locks on the Ship Canal. Here we saw three locks of various ages (two in disuse). 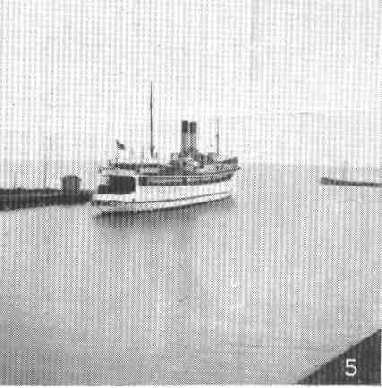 The modern lock in service will accommodate a fair sized coastal steamer. All gear of the lock mechanism is electrically controlled. The oldest lock of the three is of very early nineteenth century excavation out of solid rock by man power and hand tools only. Our train now took us to Nohab Works which were silent for the day. These works were established in 1847. First Locomotive delivered 1865. 2,000 Steam and electric locos built up to the present time. Other products are goods wagons, rail cars, snow ploughs, water turbines, diesel and Hesselman engines. The Affiliated Nohab Flygmotorfabriker r A.B. manufacture aeroplane engines under licence from the Bristol Aero. Co. Hands employed 1,400. Leaving the Works in which we had found many interesting engineering constructions on the stocks, we made our way to the adjacent Government Electrical Power Station. For the moment we fancied we were back in Limerick, but we found that nature was more helpful here than at Killaloe. The river here is a series of falls for two or three miles and the locking up of water for the intake is not so necessary as in Ireland, as there is an immense weight of water always available. Passing round the intake and descending a 100 feet by a terraced slope, we found our way into an immense power house containing fifteen machines of great capacity, thence out to the lower falls and outfall from the power house. Ascending again through the intake section of the Works, we noticed that the water passed through wire screens of narrow mesh. These screens prevent the passing of ice during the winter into the turbines and they are also slightly heated (electrically) to dissolve any ice chips that way get into them. Proceeding through the glen along the side of a roaring torrent, cascades and through the woodlands, we again ascended the slopes to get a long view of the waterfalls. Leaving the riverside for the road in the direction of Trollhättan, we diverted to a branch road in order to see the river from a bridge. Before reaching this our attention was attracted to a nook in the natural rock and upon close inspection we found a considerable number of names carved in the face of the stone. Some of the names had the figure of a crown carved over them. This we learned is a rock inscribed with the names of the Kings of Sweden for centuries past and up to the present day. Some of the stone cutting had been done by the respective crowned rulers. Proceeding to the bridge mentioned we found that the towers along the construction were control towers and below this bridge were a series of roller dams. I was curious to know and am still, whether these huge steel cylinders across the sections of the stream are eccentric to the shaft supporting them. And now to lunch with our hosts of that most interesting day. Passing through the town, back to our train, we could not but notice that the populace were in festive mood, for there were gatherings in the open spaces, and musical entertainments and sports were in progress. A beautiful day for relaxation it was. Boarding our train for the one hour run back to Göteborg, the air began to take effect on individuals and a siesta was preferable to discussion. Leaving our train at the end of the trip we were held up by a bevy of press photographers who evidently intended not to be outdone by their contemporaries in Stockholm. But they succeeded in only making poor pictures. A leisure hour followed, some to finish their nap on the couch in the hotel, others to get better acquainted with what proved to be a very interesting city with its harbours and canals, tree lined streets and squares, the Cathedral, the marketplace, the parks and places of open-air entertainment, to say nothing of the fine business centres, which of course were quiet this day. Dinner at the Eggers Hotel concluded, we said good-bye and safe journey to our Past President, Mr. Agnew, who had to keep an appointment in Koln next day and so we continued to make further acquaintance with Göteborg in a leisurely way for the reminder of the evening. I will say this about the Swedish Tour, the strain upon our staying power was not nearly so severe as during the tour of 1935 in Switzerland where we had to endure considerable fatigue, compensated for of course, by the wonderful scenes and experiences that cam our way but we missed that hour of relaxation that many wished for. In Stockholm and Göteborg we appreciated those quiet spells devoid of rush and hustle. Rising on this our last morning in Göteborg, like giants refreshed, an early walk brought an eagerness for coffee and oatcake and at 10.0 a.m. we boarded special trams for the S.K.F. Works. These Works believe in output to the nth power. Headed by our respective guides we commenced a tour of immense buildings. Up lifts, down stairs, along gangways in various workrooms, through corridors from department to department. I cannot remember seeing a single hand truck in the whole works. Belt and Sequence System seemed to be the ruling factors, being ideal and fitting the circumstances of industry of this type. Our first show was in the reception and exhibition room, containing the first ball bearing made by the firm, also the smallest bearing made at present. Graduated gauges .001 mm to sort out the various steel balls as they arrive from the rumbles. Tests for truth and soundness by rebound. 3 -1" approx. spheres doing a gymnastic stunt by remaining in column to withstand a pressure of nine tons (Vertical Stroke). This they resisted but the operator was merciless and continued the pressure up to fourteen tons before shattering these balls of steel. Every operation was interesting. The cold forging of small balls by automatic shearing and forging presses. The hot forging of larger balls 4" diameter under drop stamps. The rounding, grinding, cleaning and polishing in rumbles of millions of various sized spheres. Their hardening in moving floor pyrometer controlled gas furnaces and their consequent immersion in agitated oil. Brine or Water Baths also controlled by Pyrometer for temperature. The system seemed flawless. The cases and cages employed many machines and attendants. The polishing of the races kept the hand, home and emery very busy. The fingers of the female assemblers were never still and the rate of output by these workers is very high. My estimate is about forty per hour. Having completed our tour of the extensive floors we adjourned to the Staff Restaurant where even the least inclined to be interested in ball bearings had to face up to it, for each guest received a sample of the Works Products. Doing justice to the good fare provided by our kindly hosts and expressing appreciation for the kindness and friendship experienced here and elsewhere, we left for our Hotels, as the rain had come to continue. Later we met at the Grand Hotel to entertain at dinner and say Farewell to our Hosts and Guides of the S.K.F. So after experiencing a very wet evening in killing time we gathered our belongings and said good-by to our good friends at Eggers and Göteborg in general and made for the train. A round-up of all the remaining Kronen and Ore provided a supper at the Station Cafe, and so to bed. 7.0 a.m. found us arriving at Malmö and everyone was astir. What a pity we had not to cross the Kat-e-Gat to have a look at Copenhagen, one and a half hours away. But it was not to be, we had to push on to Trelleborg and so go aboard the ferry for Germany. Our boat this time was "The Prussien" and at 8.0 a.m. approx. we went aboard and were soon out in the open sea. Everyone was looking for breakfast and got it, only to be called for lunch at 11.0 a.m. This was too much for seven of the party, they could not face up to it this time. Train Ferry, Saßnitz (Germany) to Trelleborg (Sweden). This route, 58 miles across the Baltic Sea, occupies four hours and is jointly operated by German and Swedish Railways. Once on German soil we had to go through a bit of an ordeal before satisfying the Immigration Officers, but eventually we got clear and entraining in reserved coaches were soon on our way to Berlin, arriving at 7.30 p.m.
We crossed the city by bus to the Friedrichstraße Station and parked our bags preparatory to seeing the sights. The weather was against us again on this evening and we were not, in consequence, able to make the most of the opportunity of seeing Berlin as under ideal conditions - but we certainly found our feet and found our bearings before returning to the Station for supper, and to board the train for Köln. We had again to settle to sleep as best we could and were not sorry when daylight came next morning to find ourselves in the Essen district and approaching the Rhine Valley and Köln. Yes, this is Köln, and the rain has not travelled with us. The bright air and sunshine is cheering as we troop at 7.0 a.m. from the train to the Station Restaurant for coffee etc. and after that an hour for devotions and sight-seeing. The Cathedral, that wonder of architecture, being in close proximity was, of course, the chief magnet. As the services were in continuous progress in the nave and chapels, full observation of the beauty of the interior of this wonderful pile was impossible, but sufficient was noted to make one desirous, at some future time, to observe minutely. We were fortunate in having the opportunity, between trains, of getting a glimpse of this famous city and so, having ticked off another name on the map, we started for our last train journey of the tour of the Continent. We left for Aachen where the rough was made smooth and we said good-by to Germany and her very efficient but at the same time courteous Railway and Frontier Officers. There is little more to say. In due time we arrived at Brussels and so on to Oostende. Across the Straits we had a clear view of the Belgian Coast and as we sailed into Dover the French coast was still in sight. The Customs at Dover having been satisfied, we were not long before we saw floodlights at Battersea so at 9.40 p.m. - This was London. © Pictures originally published in the 1936 Annual report by kind permission of the Editor of "Southern Railway Magazine".